SF1 Perforation Style: Fine Perforation, Cover Height: 1 3/4" H (1U Space) Features: -Includes installed rubber edging. -Allows unobstructed view of knob settings. -Each cover is 1" deep. -Note: To enhance the level of security, use our security rack screws.. Country of Manufacture: -United States. Dimensions: Cover Height 1 3/4" H (1U Space) - Overall Height - Top to Bottom: -1.75". Cover Height 3 1/2" H (2U Space) - Overall Height - Top to Bottom: -3.5". Cover Height 3 1/2" H (2U Space) - Overall Width - Side to Side: -19". Cover Height 3 1/2" H (2U Space) - Overall Depth - Front to Back: -1.1". 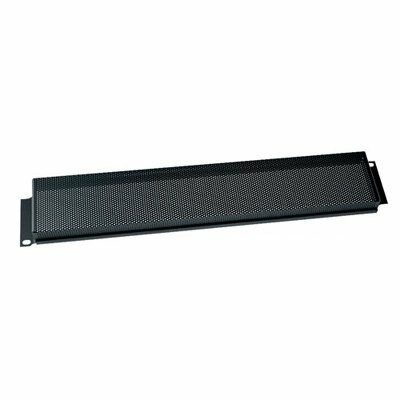 Cover Height 5 1/4" H (3U Space) - Overall Height - Top to Bottom: -5.25". Cover Height 7" H (4U Space) - Overall Height - Top to Bottom: -7".